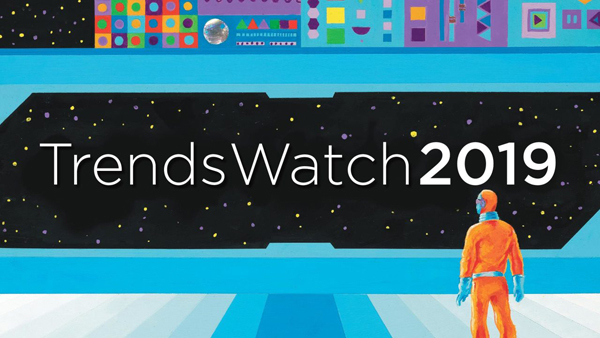 The 2019 edition of TrendsWatch—the Alliance’s forecasting report—covers the emergent topics of truth and trust, blockchain, decolonization, homelessness and housing insecurity, and self-care. The Alliance’s annual forecasting report is now available! The new edition of TrendsWatch explores truth and trust, decolonization, blockchain, homelessness and housing insecurity, and self-care. Visit the TrendsWatch 2019 landing page to access the report and associated content. While seemingly disparate, this year’s topics are in fact deeply entangled with one another. Indigenous people on settled lands suffer high rates of homelessness and housing insecurity. Blockchain technology is being deployed to help people experiencing housing insecurity access services, and to combat fake news and rebuild trust. The weaponization of news (fake or not) contributes to the stress afflicting activists combating social and economic injustice. And now, more than ever, those who help society face these challenges have need of self-care to foster the resilience they need to sustain their work. I’m honored to have had the assistance of many wise people in exploring these important topics, including, from the museum sector, Puawai Cairns, Cinnamon Caitlin-Legutko, Lisa Yun Lee, Jaclyn Roessel, Jessica and Matt Turtle, and Seema Rao. The ZKM Center for Art and Media explaining the inner workings of blockchain through the accessible medium of the popular digital collectible CryptoKitties. The San Diego Museum of Man establishing the position of director of decolonizing initiatives. The soon-to-open National Public Housing Museum creating an Entrepreneurship Hub to serve as a business incubator for public housing residents. I encourage you to use the report to spark discussions at your organization around how these trends are affecting your community, your staff, and your operations. CFM’s work is made possible with the support of the membership of the Alliance as well as our corporate sponsors. In recognition of this support, TrendsWatch 2019 is free to individual members of AAM and to staff of member organizations. This year for the first time, we are charging a nominal amount ($10) for non-members to access the report. The executive summary and the video introducing the report are free to all, as are PDF copies of past issues. Thank you in advance for supporting TrendsWatch and other resources that CFM provides to the field.